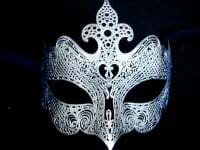 A Stunning and extravagantly designed handcrafted Venetian filigree mask. The Occhialino Venetian Filigree mask is excitingly different and feminine having an asymmetric style of scrolling decoration to enhance fine bone structures. The eye is accentuated by the lash detail & the chain adds to the overall effect. 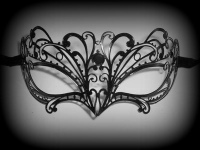 This is a light and comfortable mask to wear which ties with satin ribbons for added security. 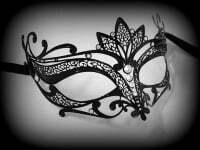 Free Uk delivery is offered on this beautiful mask.